This past weekend brought the first workshop with the Deck of 1000 Spreads and the results were amazing! The class of nine students was fairly equally divided among beginners and more experienced readers. Some were people who knew their way around a tarot deck, but one was an oracle reader and another had exactly zero experience with cartomancy. 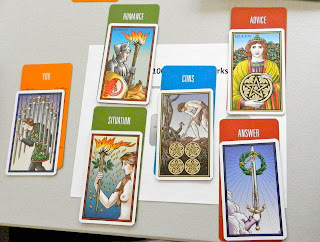 One of my tarot friends, Diane from PA, suggested that I begin the class by leaving a spread card at each reading station, then having each student pair the spread card with a tarot card and use that combo as they introduce themselves to the group. It led naturally into talking about the importance of spread position and how a card pairs with its spread position to deliver a message. Sandy's first exercise—a spread exploring money matters. Then the class began with an exercise intended to show the storytelling aspects of a spread. 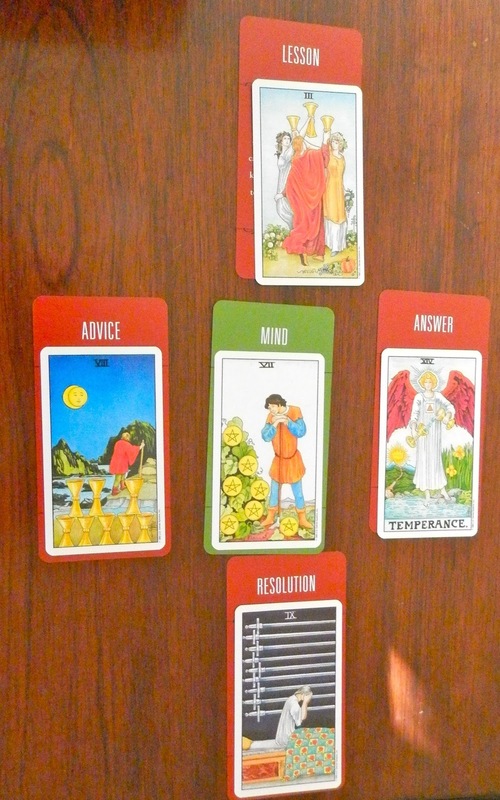 Each student began with the same four-card spread. Then they added and switched cards in the spread to illustrate the versatility the Deck of 1000 Spreads has in customizing a spread to your exact specifications. The result was nine very different spreads that came from the same origins. After that, I presented each student with a dilemma a fictional friend was having at work and tasked them with creating a spread to explore it. Again, nine very different interpretations of the issue—all nine highly valid spreads. Nikki's awesome co-worker spread. First she explores the situation and its basis in the past. Then she explores each person's role in the dynamic, their attitudes, what they can change and what they need to know. 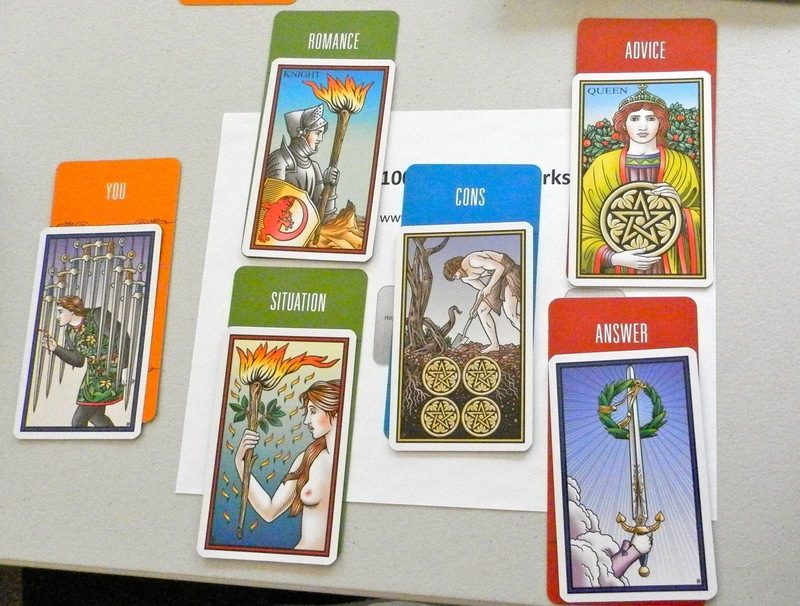 The three blue cards are meant to be read for the "you" position, then with three different tarot cards, for the "co-worker" position. 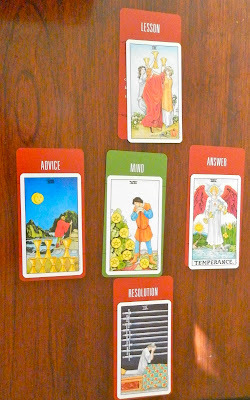 The whole spread ends with advice for moving forward. 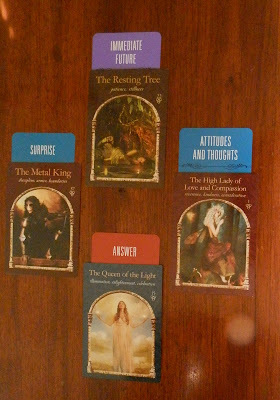 This masterwork was her second spread created with the deck! no love. Tarot of the Sevenfold Mystery. 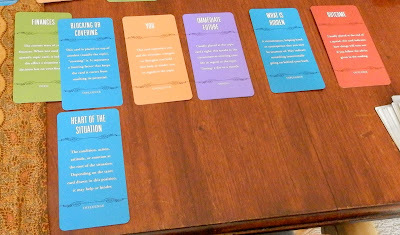 Finally, each student was asked to divine a spread by shuffling their deck and choosing cards randomly from the face-down deck. The results were astounding. Some of the spreads looked a bit challenging at first, but as we read them with tarot cards everyone agreed the spread they divined touched on something relevant in their life. Those three spreads are shown below. And because they contain tarot cards and personal issues, I won't say whose was which, but they were created by Diane, Sandy and Tom. This spread touched on spiritual goals. I don't know the name of the oracle deck. are what were needed to cultivate peace.